Hotels, especially those in the luxury bracket, can often be seen as symbolic of a culture at that moment in time, and are buildings, I believe, that are central and relevant to a city, a landscape, and its people. Despite this, and the fact that they are enjoyed by so many, those who design hotels have shared little of the limelight (in comparison to ‘star-chitects’ such as Norman Foster, Richard Rodgers et al.). However, this may be about to change. Jean-Michel Gathy, Belgian-born and KL-based architect, and head of design consultancy, Denniston International, has recently been dominating the headlines in the worlds of luxury travel, architecture and design. As the man at the top of an award-winning firm, one which has worked alongside brands such as Aman Resorts, Cheval Blanc, One & Only and GHM Hotels, Gathy has been behind a large selection of world’s most exciting hotel designs. Describing the work that his firm does as ‘lifestyle product design’, rather than classic architecture, it isn’t too much to say that Gathy has been incredibly influential in what now constitutes a 21st century world-class luxury hotel. Soaring ceilings, expansive rooms and hard-to-forget vistas are signature Gathy, and you can also thank him for private plunge pools, the obsession with large water features and the fashion for firelight. His talents haven’t gone unnoticed – in the last year alone nine hotels bearing Denniston’s magic touches have all opened to unanimous praise. With more of Gathy’s work out in the world than ever, and as a massive fan of both the man and his work, it seemed like the right time to celebrate the top ten Jean Michel-Gathy designs. One of the most anticipated hotel openings of the year, The Chedi has transformed the sleepy village of Andermatt, in the Urseren Valley, into Switzerland’s first all-year round destination. Whatever the season, sybarites will soon have something here to keep them happy. In winter there is almost direct skiing access from the hotel on to Andermatt’s scenic slopes (at the moment still very much for serious skiiers rather than the snow-bunnies), while in summer it’s all about playing golf on the Kurt Rossknecht designed (and eco-friendly) golf course. The first hotel to be opened by Singaporean hotel group GHM in Europe, Gathy has done a winning job of combing Asian aesthetics with a Swiss design sensibility. He is after all an architect renowned for combing local cultural influences with contemporary, luxe touches. At The Chedi think dark wood, warm stone, expansive walls of glass (to make the most of those views), all combined with the cosyness of a ski chalet; fireplaces (inside and out), fur rugs and cosy sofas and more. The most anticipated element of the hotel however is the spa. Facing the snow-capped mountains, I can’t think of many places where I would rather be after a long, hard day on the slopes. 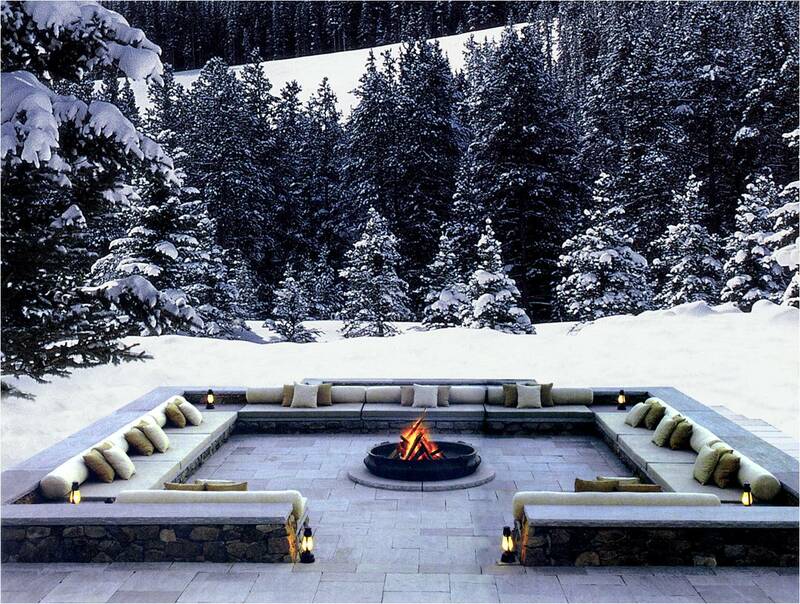 Le Melezin and Cheval Blanc Courchevel watch out; you just got a serious competitor in the luxury ski-hotel world! Amanyara is the combination of two contrasting worlds; sleek Asian design and the natural rugged beauty of one of the Caribbean’s least developed islands. Most famous for its dramatic black volcanic-rock infinity pool, this Aman Resort is where celebrities (those who shun the limelight) come to relax and unwind without interruption and paparazzi flashbulbs. Not to far away you’ll find COMO’s classic and fresh fellow-celebrity favourite, Parrot Cay (one of my top ten honeymoon hotels), but Amanyara takes the prize, hands down, for most stylish resort in the area. Situated next to the 18,000 acre Northwest Point Marine National Park on the island of Providenciales (or Provo, as it’s known to regulars), diving here, in the picture-perfect Caribbean Sea, is second to none. The resort is classic Aman; clean, simple and stylish (Indonesian woods, white and cream interiors) with signature Gathy touches – a nod to local design (the building’s timber shingle roofs), soaring ceilings, glass walls (to make the most of brilliant views) and reflecting pools wherever you look. LVMH’s first foray onto the hotel scene, Cheval Blanc Courchevel, launched with a splash in 2006 and has been practically fully-booked ever since. Understandably therefore, the luxury-goods giant’s second offering has been hotly anticipated by those who appreciate the finer things in life. 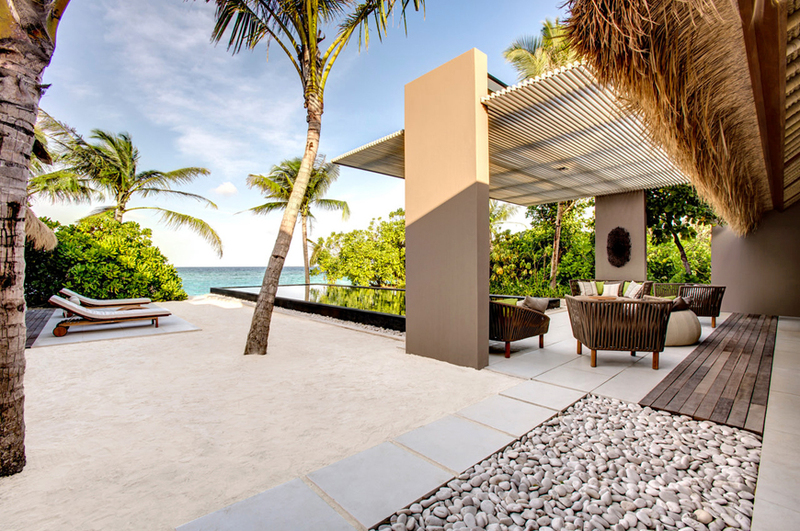 Cheval Blanc Randheli, the latest resort to open in The Maldives, is made up of 46 villas Gathy-designed villas; all are open-air, spacious, with high-vaulted church-like ceilings. Interiors blend a desert-island colour palette with a sprinkling of modern art and each come with a 40 foot long private pool (there’s nothing plunge about them). However, unlike more showy resorts, such as One & Only Reethi Rah, Cheval Blanc is all about the privacy; you go here because you don’t want to see or be seen. This exclusivity has already earned the resort an A-list clientele; the Duke & Duchess of Cambridge holidayed here in March before their big tour of Australia. Small and thoughtful touches include bicycles monogrammed with your name (so that you don’t get it confused with other guest’s) and a dedicated Majordome (LVMH speak for a guardian angel) takes care of everything you could possibly need. Too new to make my top ten hotels in the Maldives, it’s becoming very clear that this is Maldivian resort making the most waves this year. 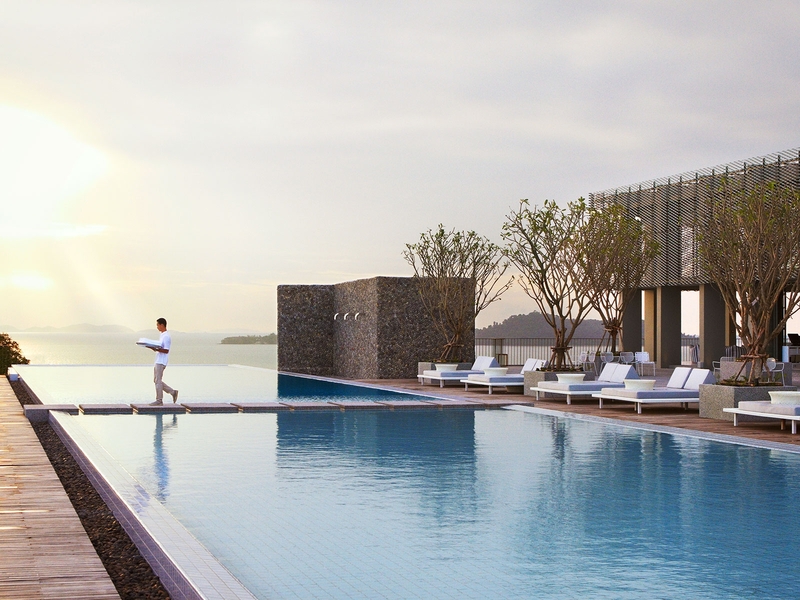 A hotel with a slightly checkered past, Point Yamu was originally developed by Aman Resorts founder, Adrian Zecha, who chose Gathy, as long time Aman collaborator, to design the hotel with Philippe Starck taking care of the interiors. For its opening under the Christina Ong-owned COMO group, (think COMO Shambhala Estate & Parrot Cay) at the very end of 2013, Ong commissioned Paola Navone, an Italian designer, who has brought touches of colour to COMO’s traditional white palette (Navone is also working with COMO on their latest project in Miami Beach). As with all COMO properties you can expect a blissful spa and deliciously fresh, and incredibly healthy, cuisine. Looking out over the ridiculously perfect Phang Nga bay (which featured in The Man with the Golden Gun) and the tranquil Andaman Sea, you won’t even notice that Point Yamu doesn’t have direct beach access due to Gathy’s breathtaking infinity pool. Although Phuket’s reputation has taken a bit of a battering over the years, the recent openings of both Point Yamu and the exclusive Iniala Beach House (recently patronaged by the Kardashians), alongside classics Amanpuri and Trisara, have put it firmly back on the map as a luxury destination. Like a massive ark, stranded above the city of Singapore, Marina Bay Sands is not a building that’s easy to miss. Dominating the city’s skyline, this multipurpose mountain (shops, a hotel, a casino etc.) caused a hate-it-or-love-it reaction from the city’s inhabitants when it opened. However, it’s hard to find somebody who isn’t impressed by Gathy’s simply spectacular rooftop oasis. The centerpiece of the structure is the 150 metre-long infinity pool which hugs the entire length of the city-facing side of the building. 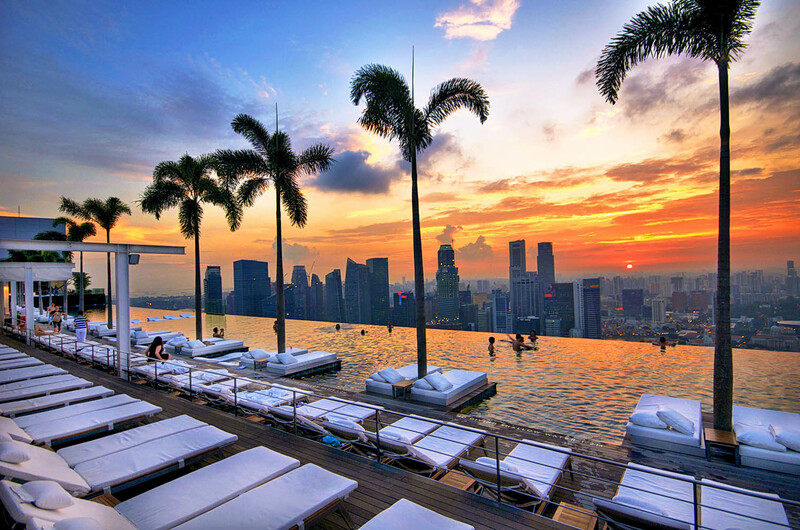 Consistently voted one of the world’s most dramatic swimming pools, this is the place to come for sun-downers over Singapore. Gathy knows how to create places that make the most of their environment, urban or rural, and this is no exception. With palm trees, a viewing deck, bars and restaurants, this is a rooftop that you could happily spend all day (and all night) stranded on. Although the view from the rooftop takes some beating, one of the best spots from which to look out over Marina Bay Sands itself is from one of my favourite rooftop bars in the world, Lantern Bar, located across the bay at the very top of the Fullerton Bay Hotel. Fresh from the success of Amanpuri in 1988, Adrian Zecha set to work envisaging his next project. No architect he approached was interested in the luxury tented camp (Zecha always has been miles ahead of the crowd), no one that is, except for Gathy. Amanwana was the first of many Aman / Gathy collaborations, and also the first of Gathy’s designs that saw the light of day. Naturally a special place to the architect, he returns to the islands every couple of years to dive and get away from it all in this far-flung, and incredibly beautiful, corner of the world. Arriving by seaplane over the turquoise Flores sea, guests enter a secluded and wooded desert island of their dreams. 20 enormous tents, a fresh water dipping pool, a spa, world-class diving – all only 22km from Bali – make this a paradise on earth. I am yet to travel to Moyo Island, but I was lucky enough to experience one of Gathy’s other tented camps on a recent trip to Rajasthan. Aman-i-Khas’s luxury tents were inspired by Mughal-era travelling tents, and certainly make you feel like a modern-day Maharaja. Having grown up in Oman I know better than most the appeal this country holds; deserts with dramatic sand-dunes that lead all the way to the sea, small villages around lush palm-fringed oases, stark cliff-faced coastlines, transparent water and perfect sandy beaches, all combined with a rich cultural history. 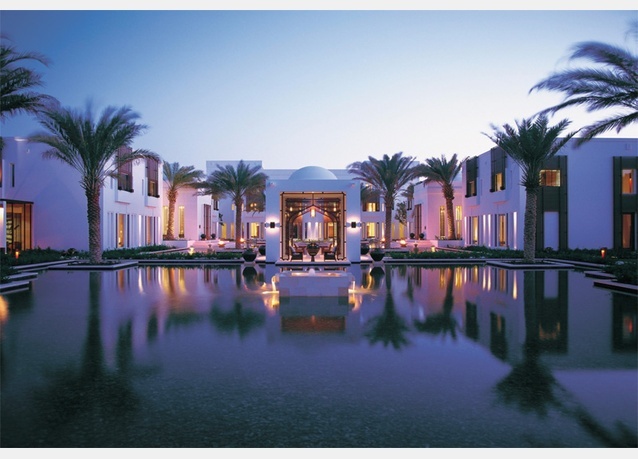 Arguably the first hotel that put Oman ‘on the map’ as a luxury destination, this photogenic GHM property has graced the pages of many a glossy magazine due to it’s Gathy-designed reflecting pool and the harmonious blend of contemporary luxe design inspired by Omani architecture and cultural influences. Where Gathy goes, other hotel brands follow. Since The Chedi opened in 2003, other big names have landed. Six Senses opened their Zighy Bay property on the county’s Musandam Peninsula, and Alila Hotels launched in Jebel Akbar just this month. An Aman is planned for the near future and a (Gathy-designed) Cheval Blanc (on its own private island) is also in the works. If you’ve been looking for a reason to go, look no further. Aman Grand Canal breaks the mould for nearly every Aman that has come before it. For starters, it’s located in a bustling city rather than a sleepy town. Although there are few urban resorts to date, this seems to be an emerging trend for future Amans; hotels in Tokyo and Portugal are in their final stages of development. Secondly, the hotel is housed in a historic building – a 16th century palazz0 no less – (similar only to Amangalla, Amansara & Amantaka) where the owner’s family still live upstairs (a princess, a count and their five children). And thirdly, although exquisitely done, it’s about a million miles from the clean minimalism associated with the brand. 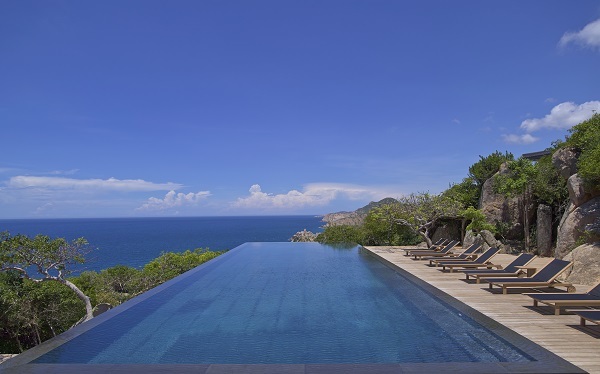 Since it’s opening in 2013, a busy year for Aman Resorts, the hotel has been praised on almost every front. However, its most successful feature, in my opinion, is how it manages to blend the old and the new, the sleek and the splendour, so seamlessly. This is of course all down to the genius of Gathy, who knew it would be a mistake to compete with the Italian extravagance, and instead went ahead with modern and minimalist interiors (with furniture by B&B Italia) and a chic colour palette of white, gray and black. 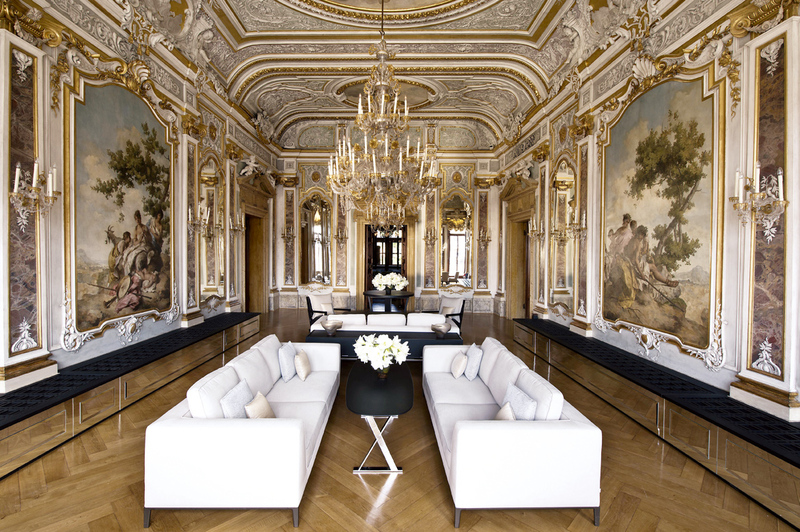 Fully booked since its opening in 2013, Aman Grand Canal Venice has become an overnight sensation, and a reason in itself to visit the sinking city. Located in Burma’s northern Kachin State, Malikha Lodge was opened by Brett & Omar Melzer (of Eastern Safaris – the company behind the exquisite ‘Balloons over Bagan’) but has since been taken over by a Burmese government-related hotel company, Kandawgyi. 10 individual bungalows, nestled within leafy bamboo trees, and with views over the Nam Lang river, rice paddies and snow capped Himalayan peaks behind, are centered around a handcrafted teak bathtub and each come with a working fireplace. In addition to the main lodge, where guests come together to eat in a communal style warmed by log fires, the hotel’s signature space is the outdoor lounge with its stylish fire-pit (oh so Gathy). Although in Burma recently, I sadly didn’t manage to make it up this far. However, there’s always next time … the perfect excuse to go back. With so many recent openings under his belt you would be forgiven for thinking that Gathy would be tempted to rest, recharge his batteries and simply enjoy his success. This couldn’t be further from the truth. In fact, if you can believe it, projects in the pipeline are almost more exciting than those to date. Upcoming openings and ongoing developments include a trio to Aman Resorts in Gabon, rumoured Amans in Rio de Janeiro and Portugal, The Chedi in Greece, a Park Hyatt and Andaz in China and two Cheval Blanc properties; one of in Al Soda, Oman, and the other on Amoun Island in Egypt – the property which Gathy claimed may be some of his best work to date. Have you been to a Jean-Michel Gathy design recently? If so, I’d love to hear what you thought about it. If you haven’t been, which of his design is next on your t0-visit list?